A grackle or grakle noseband is also sometimes called the 'figure eight' or 'crossover' noseband. The Grakle noseband is named after the racehorse Grakle - winner of the 1931 Grand National steeplechase. It was designed to try to control him as he would pull hard during a race. The grackle noseband consists of two diagonally crossing narrow straps with their crossover point (usually over a small circular pad of sheepskin or felt) on the front of the horse's nose. The object of a grakle noseband is to prevent or at least discourage a horse or pony from crossing his jaw and opening his mouth to evade the action of the bit. British Dressage has recently changed its rules and now allows grakle nosebands in affilitated dressage competitions. If a horse wearing a bridle with a grackle noseband tries to open his mouth to evade the bit he will feel pressure on bridge of the nose and his chin groove. A bridle with grakle noseband has a similar action to a dropped noseband but as it acts over a wider area which makes it more effective in preventing a horse or pony from crossing its jaw. The top section of each strap of the grakle noseband passes under its relevant bridle cheekpiece, and they meet and fasten near the jaw. The lower sections of the straps pass under the bit on each side, resting in the chin groove again, and fasten on the nearside just below the bit (some riders fasten them so the buckle lies between the bit and the crossover point). As with any noseband which passes along the chin groove, should the horse attempt to open his mouth, not only will he feel pressure in the chin groove but on the bridge of the nose, too, which has the subsidiary effect of bringing the nose in and maybe down. The grakle and the flash noseband, which has a similar action are unlikely to interfere with breathing. They must be fitted snugly but comfortably, again allowing you to slide a finger under the straps all round — though if they are too loose, they will be ineffective. The Mexican Bridle or High Ring Grakle is a type of grakle which has been designed to remove the pressure on the fleshy part of the horse's jaw and teeth. 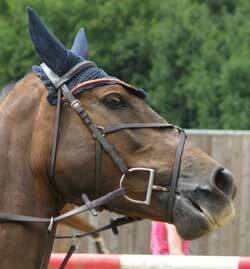 A grakle noseband should not be used together with a standing martingale. Advice about benefits and fitting of an english, high ring or mexican grakle noseband, Advice about using a Grakle Noseband - How a Mexican Grackle Bridle works to control a horse or pony. How to fit a grackle noseband.